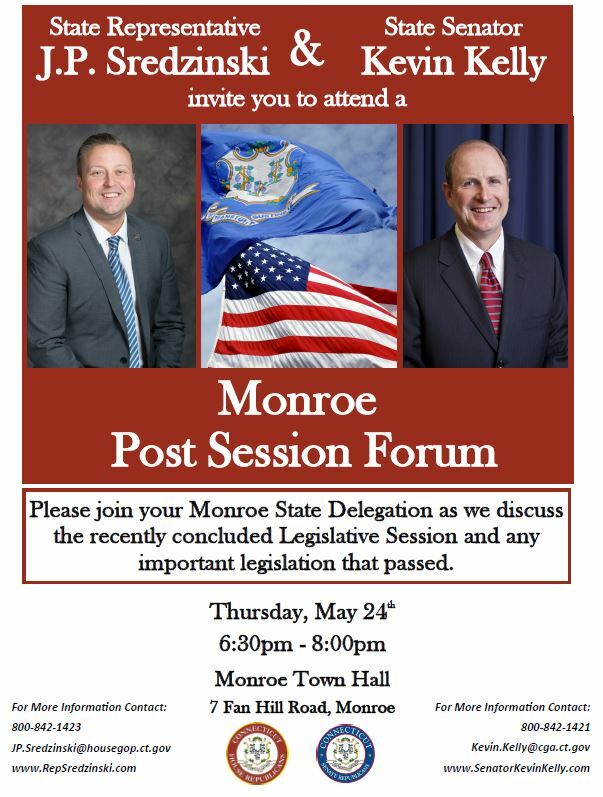 MONROE – State Rep. JP Sredzinski (R-112) and State Sen. Kevin Kelly (R-21) are holding a post-session town hall meeting on Thursday, May 24 at Monroe Town Hall. They will discuss legislation that passed this year and other issues pertaining to the conclusion of the 2018 legislative session, including the status of the state budget. See attached flyer for further details. Anyone who is unable to attend but would still like to speak to the legislators can contact Rep. Sredzinski at jp.sredzinski@housegop.ct.gov or Sen. Kelly at kevin.kelly@cga.ct.gov.